Primequal™ TalentIH™ M.I.S. adhesive applicator kit is a groundbreaking cynoacrylate micro dosing delivery system developed to allow a safer, faster and solid bonding of surgical mesh. TalentIH™ is the first of a next-generation of adhesive applicator designed for surgeons to look into new, simple and reliable solutions to improve patient care and safety. 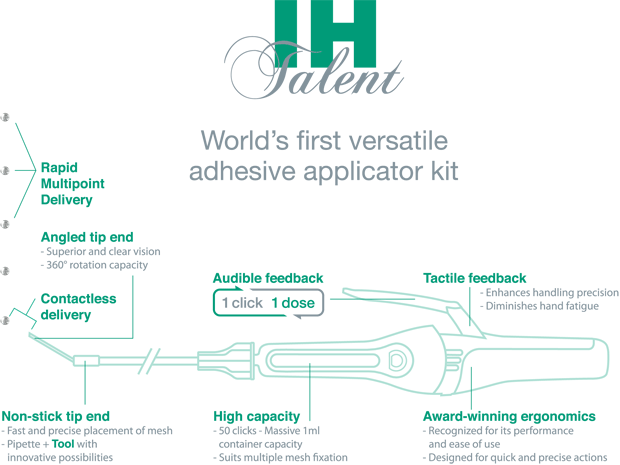 TalentIH™ is the world's first versatile adhesive applicator kit. This is because it can be used with multiple glues 1, it can fix multiple meshes and based on its cumulated skills, it will adapt to any situation. TalentIH™ innovative patented technology controls the precision and recurrence of the micro dose simply and comfortably. It has the unique ability to produce a Contactless Delivery, administering a dose safely and precisely without being in contact with the mesh or the tissue. TalentIH™ automatic single button operation enables a faster procedure, including Rapid Multipoint Delivery under time pressure. Micro dosing delivers a thin layer which is an accelerating factor for polymerization of the cynoacrylates. AutomInject™ patented technology enables TalentIH™ to deliver a precise micro dose each time the lever is pressed. It is a fully automatic dose per dose delivery from the first to the last dose. 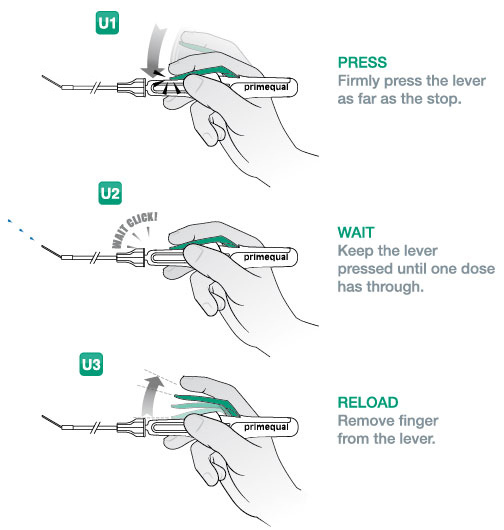 AutomInject™ produces a « click » sound after every dose, enabling the surgeon to effectively monitor the correct dosage: 1 click = 1 dose. The treatment is therefore greatly simplified to a click based procedure. TalentIH™ has been designed to ensure that no air bubble can disturb the procedure. TalentIH™ should be filled with the required dose for the surgery. Liquid path has been optimised to minimise dead space and wastage. TalentIH™ enables surgeons to perform a precise delivery immediately without any training, saving time and money and providing increased comfort and precision for themselves. TalentIH™ is equipped with an overpressure safety feature that will avoid administering glue incorrectly. TalentIH™ is compatible with most cynoacrylates 1. Filling TalentIH™ is identical to filling a standard syringe, simple and fast. TalentIH™ is based on the multi award winning Preciquant™ technology. Preciquant™ technology is used to provide painless injection to children, metered dosing for specific injections and pharmaceutical drug delivery.